Recorded at the Standard in East london on the 18th of march this year. This recording gives you some idea as to why they are so popular because ‘live’ is where this bands strength lies. Starting with a new song we get an aborted start as somebody was onstage who shouldnt have been.Now most bands would have edited that out but this adds to the charm of the entire album, as does keeping the inbetween chat from main vocalist Martin. But what of the music i hear you cry ? Opening track has a classy old school mid-tempo thrash feel with some Maidenesque guitar work towards the end, song reminds me of Slayer's "Bloodline", it's that good. To be honest each track just reeks of 'class' the musicianship here is virtually unrivalled by any metal band around at the moment. Of course its not all perfect (Boo Hiss) for there is a single blight upon this perfection and that dear reader is the inclusion of Metallica's Harvester Of Sorrow, which i might add they do very well, but for those who know me i cannot stand that awful NWOBHM tribute band. 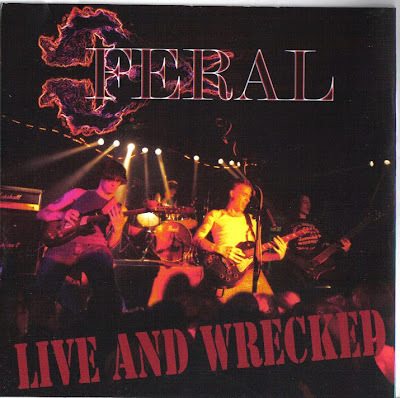 However my personal view aside i still would not have included this because they are better than that, many bands run out of ideas and include a cover to pad out an album, Feral clearly have enough ideas and songs for a double album, so guys nothing wrong with a cover live but not for an album.